Cobb STEM Certification provides schools with clear guidelines and criteria to support them along their STEM journey. What is Cobb STEM Certification? ​Cobb schools may earn Cobb STEM Certification by meeting a specific set of criteria. 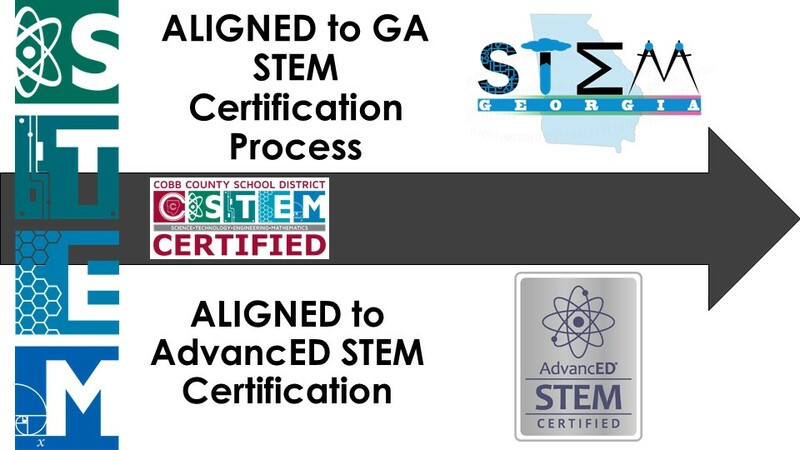 Cobb's certification program is aligned to the GA STEM Certification process as well as AdvancED STEM Certification. Schools interested in applying for Cobb STEM Certification will be asked to compile a digital portfolio with evidence to support meeting each of the indicators listed on the STEM Certification rubric. Portfolios may be in a variety of formats, but should provide the Cobb STEM Review Team and STEM Advisory Board with a comprehensive look at the STEM practices and programs in place at the local school. Visit the links below to learn about program specifics.